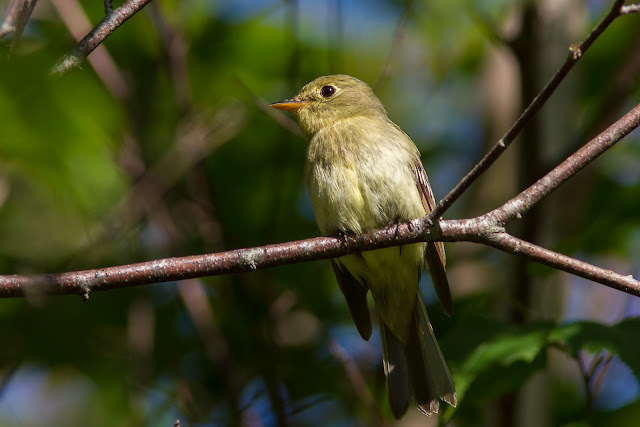 In the morning, we met up with James Hirtle (who had been invaluable on our January trip) and drove down to Milton with Yellow-bellied Flycatcher as our target. There, we met up with Dorothy Poole who led us on a delightful walk nearby. Even at 8:30, there was a good amount of song activity. 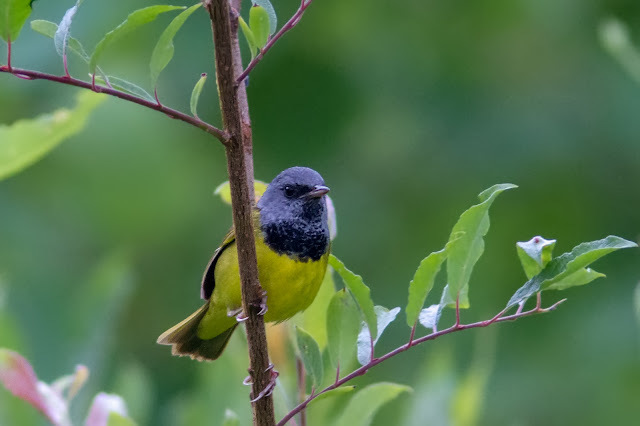 In short order, we had good views of Magnolia Warbler, Blackburnian Warbler and Blue-headed Vireo. After a while, we came to a spot where Dorothy had recently seen a Yellow-bellied Flycatcher. We listened intently and could hear one in the distance. With a bit of coaxing and patience, we finally got some good views of this new team bird. James then led us back to the Bridgewater area where we walked a couple of birdy trails. We saw Chestnut-sided Warbler and Gray Catbird, both new for the trip. 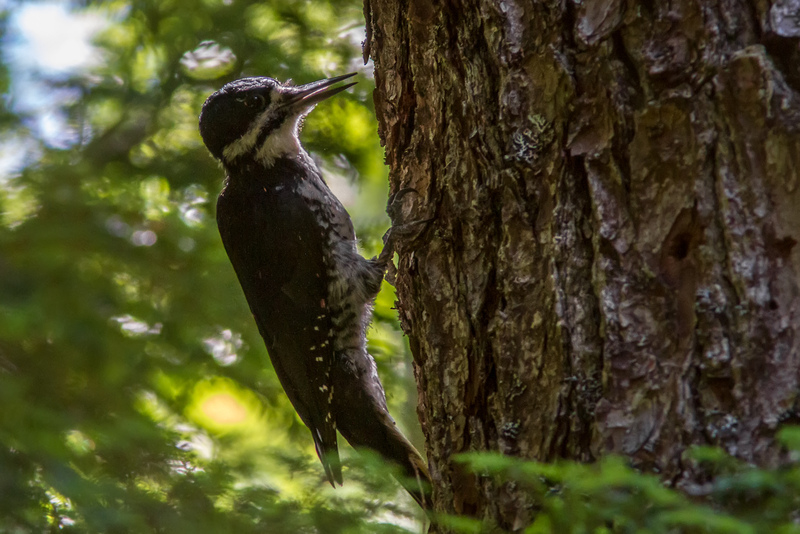 We then quizzed James as to where we might find Black-backed Woodpecker and Mourning Warbler. Armed with this info, we headed northeast (though I’m never quite sure what direction I’m going in Nova Scotia!). Our next stop was Mount Uniacke Estate Museum Park in search of the woodpecker. It was mid-afternoon on a hot day so we were a bit pessimistic about our chances. Along the trail, Winter Wren and a couple of other birds were singing but it was pretty quiet. In the distance, we could hear a gentle tapping so we quickened our pace and eventually saw our target Black-backed Woodpecker. A little bit further, we saw a pair of them. Quite content, we returned to the car and went off in search of an ice cream cone to reward ourselves. Rob and Caroline – Ray’s son and daughter-in-law – had invited us for dinner and we arrived at their place late in the afternoon. Rob had told us about a nearby cave that has had three species of bats. Armed with somewhat vague directions from a website, we figured that we had just enough time to visit it before dinner. 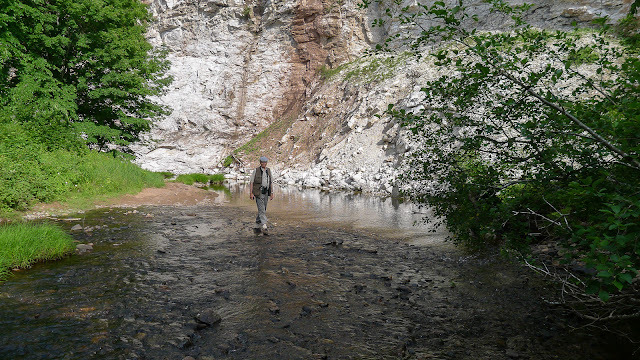 To get to the site, we had to cross a stream, climb up a slope and then descend down into the cave. 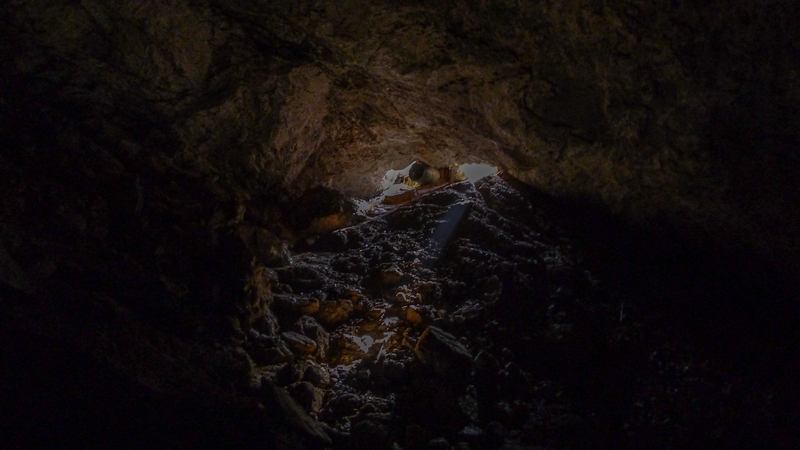 I got to the cave opening first so went down into the cool underground cavern. The others decided they would await my reconnaissance (not that they were afraid of cool, dark, damp places!). A ten minute search didn’t turn up any bats nor any trace of them (i.e. guano) … another bat adventure coming up empty. After a delicious dinner and a pleasant walk through the woods, we headed to a motel in Truro. We were up early and headed to the Folly Lake area before breakfast. 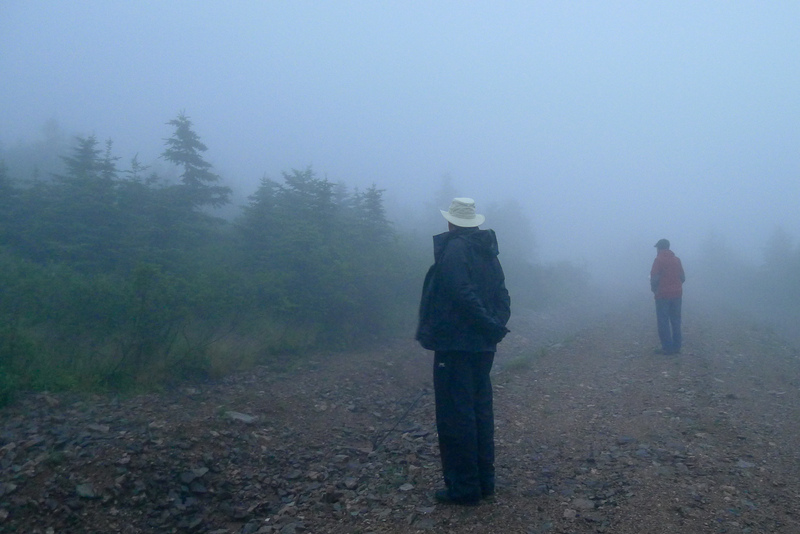 James had given us GPS coordinates where he had seen a Mourning Warbler a week before. The weather forecast wasn’t good but so far the rain was holding off. 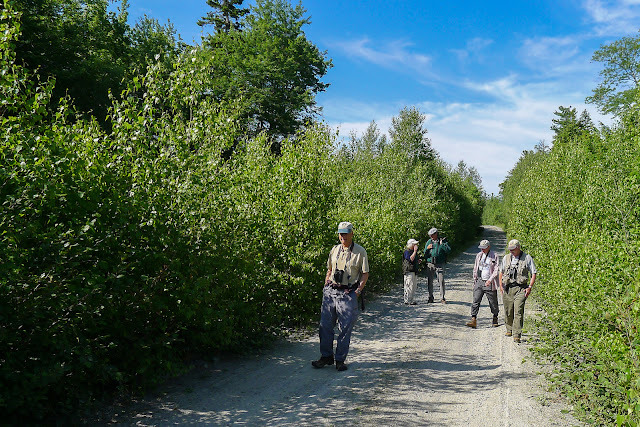 We didn’t find the warbler at Jame’s spot but saw some similar habitat 300 m away and checked it out … success! Just as we got back in the car, the rain started in earnest. 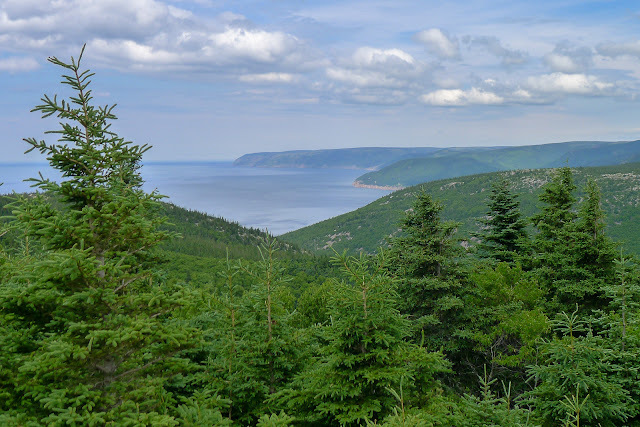 The rest of the day was spent driving to Cape North on Cape Breton Island. Our main target bird here was Bicknell’s Thrush. We had some good location information from a couple of sources but were concerned that we might be a bit late in the season. As we would need to be at the site before dawn, we decided to check it out that evening. We found the site okay and determined that we would have to leave at 4 a.m. the next morning … ouch! We awoke to a heavy fog, winds and a light drizzle but didn’t even think of aborting our mission. Ray did a fine job of staying on the road that he could barely see and we arrived on site at about 4:40 am. All was quiet at first but then a White-throated Sparrow called out followed by some Mourning Warblers. We decided to walk the road and finally at about 5:05 am we heard a promising sound. We walked closer and a Bicknell’s Thrush sang its distinctive song. We heard the bird call a couple of more times and then it was silent. With lousy weather and heavy undergrowth to contend with, we didn’t even try to chase the bird. While we would prefer to see all the birds, we do count heard-only birds – the heard-only list now comprises Bicknell’s Thrush, Boreal Owl, Yellow Rail and Chuck-will’s Widow. Our next target was Black Vulture – one had been reported at the dump a couple of weeks ago. Unfortunately, the dump didn’t open until 8 am so we went back to our rooms for a while and then had a hearty breakfast. At the dump, the workers told us they hadn’t seen the bird for a couple of weeks so we didn’t waste much time looking for it. There weren’t many birds to see en route to the ferry terminal but we did make occasional stops to enjoy the views of the Cape Breton highlands. Phil got a surprise when he rolled down the window and a gull sent him a present from the sky! 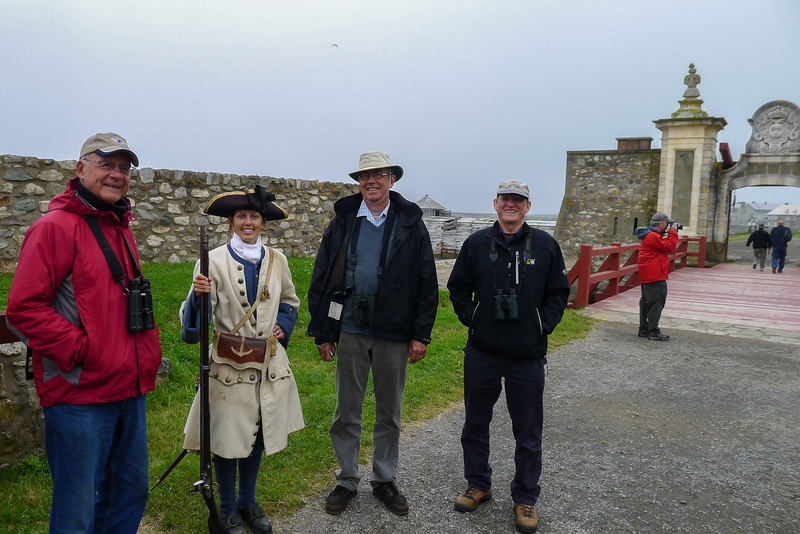 The foggy, damp weather persisted all day so, instead of birding, we headed to Louisbourg to get a history lesson. 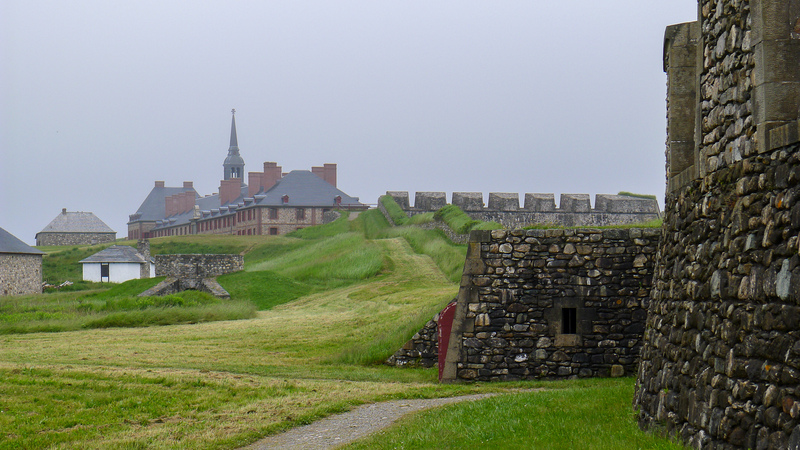 We visited the Fortress of Louisbourg, a National Historic Site (http://www.pc.gc.ca/eng/lhn-nhs/ns/louisbourg/index.aspx ). We departed Nova Scotia by way of the ferry heading to Argentia, Newfoundland. The weather continued to be a problem as the wind, rain and fog made it difficult to see anything on the sea. We are pleased with the birds we recorded in Nova Scotia, getting 4 of 5 targets in the last 3 days. At times the birding was slow (mostly weather related) but not to worry, we had a few adventures along the way to keep things interesting. In Bridgewater, one of us went for a walk and upon his return, opened the motel door and ripped the security chain off the wall (obviously, the only security aspect is the noise the chain makes when landing on the floor!). On our way to Truro, the driver (who shall remain nameless) three times ignored the GPS imploring him to make a U-turn resulting in an extra 15 minutes of driving. Of course, the gas gauge was reading empty and there were no gas stations around. The next morning, two hours after leaving Truro, one of us discovered that his binoculars were still in the breakfast restaurant. Fortunately, we had a spare pair with us and we continued our journey northward after making arrangements to get the forgotten binoculars to Calgary. Even dinner can have its surprises – one evening the four of us ordered what we thought were full course meals but only three dinners arrived along with a somewhat puny sandwich. It turned out that there were two similar sounding items on the menu. An order of fries provided by a sympathetic waitress and a coconut cream pie for desert were sufficient to stave off any hunger pains. We would soon find out (as will you with our next post) that some unplanned adventures would also happen in Newfoundland.